RollBy™ OnBoard Speedometer displays speed & distance on your SmartPhone. RollBy™ OnBoard Speedometer transmits speed (3 MPH - 200 MPH) and distance with Bluetooth Low Energy (BLE) Radio to your SmartPhone. Displays with free Android or IPhone App, requires Android 4.3 or iOS 9.0 or greater with BLE capability. Continuously measures speed and distance while train is moving: current, average, max speeds, real & scale distance, elapsed running time, and more. 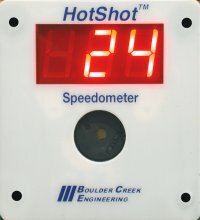 HotShot™ Trackside Speedometer catches speeding locomotive engineers. HotShot™ Trackside Speedometer displays the scale speed of passing trains (3 MPH - 400 MPH) in large bright red digits. Adapts easily to KPH. If engineers exceed the set Speed Limit, their speed will flash and an alarm will sound. There's no hiding from this railroad speed trap! A single button push reports last train speed, train count for session, high and average speed for session, and the all time high speed record. Mounted on a fascia faceplate, HotShot™ Trackside Speedometer includes Photo Sensors for typical room lighting — dim light requires 2 NightScope™ IR Detectors (sold separately). See our TrainBoss™ Defect Detectors in action. The TrainBoss™ Talking Defect Detector speaks and displays 6 types of defect alarms for passing trains with the probability you assign. The Talking Detector also reports axle count, train speed and length, and temperature — just like automated detectors on the prototype. Or if you prefer, listen to the rear trainmen report defects and speeding. See our WeighStation™ Track Scale in action. With two display modes, the WeighStation™ Track Scale emulates track scales of all eras. WeighStation™ Track Scales realistically display weight when a railcar moves onto the scale track. Weight varies from car to car within a user-defined range. See our BrassHat™ Announcers & Sound Recorders in action. Record and play the unique sounds and messages you want for your railroad with BrassHat™ Announcer and Sound Recorder. Pushbutton editing, built-in microphone, LINE IN recording from PCs, CD players and other sound sources makes recoding easy — no computer needed! A variety of sound outputs and volume controls, control outputs and inputs, and automatic playback options makes BrassHat™ Announcer and Sound Recorder very flexible. Mounted on a fascia faceplate, BrassHat™ Announcer has 5 pushbuttons to trigger up to 10 separate messages and sounds. A pre-recorded "outdoor crowd" background track is included, along with the standard user-recordable background track. Total recording capacity is 3 minutes 36 seconds. BrassHat™ Announcer is the perfect choice for fascia-triggered passenger station, yard and industry announcements. These can be mixed with background and automatic sound playback. BrassHat™ Sound Recorder records and plays back up to 8 separate messages and sounds, along with a user-recordable background track. Trigger playback with pushbutton switches (not included), other connected electronics, or with auto-playback options. NightScope™ Infrared Detectors sense trains in any (or no) light, driving LEDs, motors, and a wide variety of popular model railroad electronics. Instant Response model (Black) turns off immediately on departure. Delayed Response model (Red) holds detection for 2 seconds after train departs, ignoring gaps between railcars. Jim Ferenc will be presenting at the NMRA National Convention in Kansas City, MO on August 5 - August 12, 2018. In "A Day in the Life of the Rio Grande Southern", Jim shows how we can recreate November 27, 1900 from the Dispatcher's Train Sheet. Train movements, passenger traffic, freight consists, engine assignments, snow fighting, delays, and more are revealed step by step and presented with maps, photos, and graphs. The presentation handout is under "Articles" in the navigation menu above. Watch scale speed and distance as your train travels around your layout — measure real distances between stations and elapsed travel times too! The OnBoard Speedometer installs in an N, HO, O, or Large Scale rail car. The RollBy™ Train Speedometer App (free from App Store) keeps track of several OnBoard Speedometers at once, displaying maximum and average speeds, real and scale distances — and more — in either feet/miles or meters/kilometers. The App requires iOS 9.0 or higher, and Bluetooth Low Energy support. Whether you're surveying your Main Line, or keeping an eye out for speeding engineers, RollBy OnBoard Speedometer & Train Speedometer App are just the ticket! Check out our demo on YouTube™. Or download the Train Speedometer App now from the App Store to see if your mobile device is compatible and try it out! A new Large Scale Rotation Wheelset extends RollBy™ OnBoard Speedometer to G, Fn3 and other large scale trains. The new Wheelset is built from a Bachmann 31mm diameter / 45mm gauge insulated wheelset. Now you can check speed and distances on your large scale indoor or garden railway. Turn your Android SmartPhone or Tablet into a dashboard speedometer and odometer with the new RollBy™ OnBoard Speedometer. Watch scale speed and distance as your train travels around your layout — measure real distances between stations and elapsed travel times too! 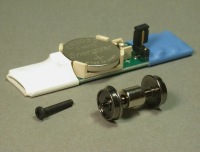 The OnBoard Speedometer installs in an N, HO, or O Scale rail car. The RollBy™ Train Speedometer App (free from Google Play Store) keeps track of several OnBoard Speedometers at once, displaying maximum and average speeds, real and scale distances — and more — in either feet/miles or meters/kilometers. The App requires Android 4.3 or higher, and Bluetooth Low Energy support. Or download the Train Speedometer App now from the Google Play Store to see if your mobile device is compatible and try it out! Boulder Creek Engineering has just released the latest WeighStation™ Track Scale with two new features. For vintage modelers, the new "typewriter" display mode taps out weight values one digit at a time, accompanied by a keystroke sound, suggesting the swift typing of a harried weigh clerk. This release also adds the Report Data Link, connecting the Track Scale to point-of-sale printers, C/MRI, computers and other electronics. The Data Link sends weight messages for each car — perfect for coal marshalling yards and other weigh-intensive industries. Visit YouTube™ for a demonstration. 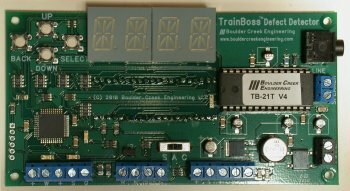 Boulder Creek Engineering has just released the latest TrainBoss™ Talking Defect Detector with two new installation options. The Detector's two Axle Sensors can now be installed to cover a double track main line or two widely-separated single track locations — two detectors in one! Or the Axle Sensors can be installed on track approaching bridges and tunnels to give high/wide load protection. These options report a train's accurate axle count but not its speed or length. The original single track installation option is still included and is the best match to modern defect detectors. This option reports true axle count, train speed, and length. Upgrades for current TrainBoss™ Talking Defect Detectors are available. Browse on over to YouTube™ for a demonstration. How fast is my train really moving? How fast was the speediest train in the history of this railroad? HotShot™ Speedometer has the answers. This Speedometer displays the scale speed of passing trains — and alarms just like a highway speed trap if you break the pre-set speed limit! And it keeps a record of fastest and average speed in a session, the all time speed record, and more. Now your road crews can test and improve their speed judgment — and try to keep The Limited on schedule without getting caught! Browse on over to YouTube™for a demonstration. There's no escaping notice as you slink into Union Depot 2 hours late with the Limited! With the push of a button on BrassHat™ Announcer's faceplate, the Station Master announces your arrival. The Announcer records up to 10 messages or sound tracks and plays them back on pushbutton demand or through a variety of automatic options. It's perfect for fascia-triggered announcements for passenger stations, yards and industries. Or do you need custom sounds for that special industry — a unique sound module with flexible playback? The easy-to-use BrassHat™ Sound Recorder has 8 recordable on-demand sound tracks, plus a recordable background track. Both Announcer and Sound Recorder will bring your railroad's industries, engine facilities, towns, and right-of-way to life with audio tracks that you record. 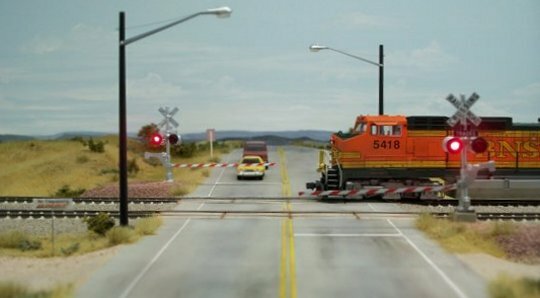 Model Railroader Magazine's July 2012 issue features a two-page article describing the installation and use of a WeighStation™ Digital Display Track Scale on their 4x8 Virginian Ry. project layout. Virginian operators weigh newly loaded hoppers from the layout's mines at the Rogers coal marshalling yard. MR editors also demonstrate weighing coal in a Virginian operating session video (Part 20 in the Virginian project series) on the MR website. The website also has paperwork used to originate and weigh coal traffic. Needless to say, we are very pleased that the editors of MR chose the WeighStation™ Track Scale for the Virginian! Boulder Creek Engineering demonstrates how to drive Tortoise Switch Machines in the latest update of their NightScope™ Infrared Detector Application Guide. 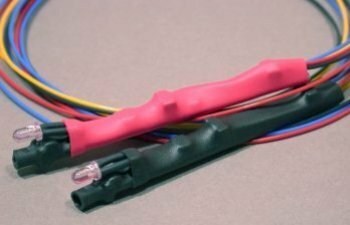 One or more Infrared Detectors can drive up to 4 Switch Machines. NightScope™ Infrared Detectors make animating your layout easier than ever! Boulder Creek Engineering has just released the latest TrainBoss™ Talking Defect Detector, and the big star is the new Female Automated Voice. Select either the Male or Female Automated Voice when ordering. You can order an additional Voice Chip of the opposite gender if you want to swap between the two. Other new features include Radio Static Bursts before and after automated voice messages, a Greeting Message when a train is first detected, defect counting from the rear of the train, and more. are trademarks of Boulder Creek Engineering, LLC.